Remember as a kid, the biggest money issues we personally faced were pretty much whether we could afford that new set of roller skates? Things sure change when you’re an adult! Even though we now have ‘real’ jobs making ‘real’ money, it’s so easy to lose track of it and end up in the hole. Since everyone deals with money, I thought My 5 Best Money Saving Tips would be just the ticket to help us all out! Now, understand that I’m definitely not perfect with finances – but these tips that I’ve been slowly turning into habits have made a big difference in our budget. They may not all be for you, but see if even just one or two could make money a little less stressful of a thing in your life! You know how they say to use a cash system, because you HAVE to stick to your budget? My problem was carrying all that cash around – it never worked out well, plus was super frustrating fitting it in my wallet, and the risk of having it stolen. That’s why I’m loving my new American Express Serve® Cash Back Prepaid Debit Card! It’s not a credit card, it’s a full service reloadable prepaid debit account offering convenient and easy access to money management tools at no or low cost PLUS cash back on purchases you make everyday. It’s also the only prepaid debit account with 1% cash back on purchases. If you’re spending money anyway, why not earn some of it back – and it’s added to your account quickly after your purchase so it’s ready to spend whenever you choose. I love that it’s more secure than carrying cash, but has the same benefits! I just load my budgeted amount onto the prepaid debit card, and that’s what I have to stick to – without the bulk and hassle of dollar bills. We also are taking advantage of it in our upcoming Disneyland trip – loading it with our ‘fun money’, so we can’t go over budget! Sure will beat cash in a busy park and a bulky shoulder pack on the roller coasters! To get your prepaid debit card, you can register on-line and it comes in the mail for free – or purchase one at a retailer for up to $3.95 (depending on the retailer). No credit checks, minimum balances or hidden fees – just a low monthly fee of $5.95 (can easily earn this back with the 1% cash back). There’s free direct deposit, free online bill pay and free in-network ATM withdrawals. For out of network ATM withdrawals there’s a $2.50 American Express Serve Cash Back Prepaid Debit Card fee. I use to plan my weekly menu on what we felt like eating – but sometimes that ends up being the more expensive things because nothing on our list is on sale! Now we wait to see what the sales are, then pick our meals from the ingredients we can nab for cheaper. If ground beef is on sale, perhaps it’s meatloaf that week. Chicken for a great price? Why not toss some in the crock pot for a dinner? Here’s 15 other tips when it comes to your grocery budget. In our neighborhood, we had several people furious this summer because they were certain the utility companies were overcharging them because of the high costs. I checked ours, and it was the same as it should be from previous summers! After talking with a few of them, I learned a few things we were doing that they didn’t bother with – that saved us a LOT of money. Set the temperature higher (summer) or lower (winter) when you won’t be home. Do the same for at night when you’re sleeping – you can always use more or less blankets! Don’t waste water – take shorter showers (I love long showers, so compromise with ‘medium length’) don’t do a load of laundry that isn’t full or run a dishwasher that is practically empty. Don’t water your lawn during the hottest times of day. In summer, if it cools down in the evenings then turn your A/C off and open your windows – let the FREE breeze cool your house. It’s saves so much money to avoid eating out (at least too often, sometimes is a nice treat). That being said, it’s so much EASIER to eat out a lot of the time! You can help this by planning ahead with your shopping/menu planning, prep things ahead of time (like over the weekend) and taking advantage of simple crock pot meals. Another great idea that I love is making a bunch of freezer meals at once, then enjoying them the rest of the week. Go nab your American Express Serve® Cash Back Prepaid Debit Card now and start using it, plus applying these other fabulous money saving tips to help your budget! I received a free digital copy of this book to facilitate this review. All opinions are 100% my own. Guys I’m So. Dang. Excited! I’m part of the launch team for Dave Ramsey & Rachel Cruze’s (his daughter) new book: Smart Money Smart Kids. Now that I’ve read the entire thing (and am preparing to re-read it), I have to admit I don’t even know where to START in telling you guys about it! Seriously, there is so much amazing info in it for raising your kids to be smart with money, have a grateful heart, and basically prepare them for a successful future! The best way to begin something is just to begin, right? I think this ‘beginning’ should be mine and Hubby’s not-so-great financial history. So let’s just dive right in, shall we? First of all, I’ve been a huge fan of Dave’s for awhile now. 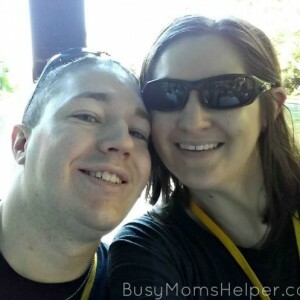 After reading his Total Money Makeover book, it completely changed how Hubby and I view our financial situation. Up until that point, however, our financial knowledge was very VERY limited. Starting our family while still in college, we used that as an excuse to rack up substantial student loans to cover our education and many living expenses. We also didn’t think much about going on several family vacations. Add to that our attempts at starting a large business that completely failed and lead us to bankruptcy…..ya, our financial situation was beyond critical. After reading the Total Money Makeover about two years ago, we decided to turn our lives around completely. We started by moving to an area (and different state) where there was much more job potential (and a lot better pay) than where we were stuck in Utah. By doing so, we tripled Hubby’s annual salary. I have yet to figure out how we got by before….a mixture of amazing family support and the grace of heaven, probably! We have now been working as hard as possible to get rid of our debt, which currently sits at an appalling $105,000 NOT including our home! The majority is student loans, then there’s one auto loan, a little credit card debt, and a chunk that we owe our parents (for daycare and such help while we were in school). This is not chump change, guys! We’re throwing as much as we can at this debt, and making many sacrifices along the way. No cable (not really a sacrifice), driving as infrequently as possible to save on gas and repairs, keeping a close eye on our utilities and groceries (see the 15+ Best Grocery Budgeting Tips Ever), and trying to avoid ‘extra’ stuff such as eating out and toys/games/etc. It’s a long process, but we’re determined to pull this off! Now, I’ll be perfectly honest with you all: Hubby makes a pretty decent salary. Growing up, I never would’ve thought my family would have this income with just ONE spouse working. But think about it….this nice salary is going mostly to DEBT! To things that are in the past, instead of things we could enjoy now or save for in the future. Depressing, right?! This is NOT what I want for my kids, so I want to arm them with as much knowledge, experience and attitude as possible in financial wisdom. That’s where Smart Money Smart Kids comes in! Dave and Rachel break it down into very specific, age-appropriate levels. With lots of personal stories and a back-and-forth type narrative, this is so fun to read! What I love the best, though, is that these lessons not only teach kids how to be financial smart, but it helps build their entire character in a way they can TRULY succeed in their life! Build the desire in your kids to WORK, not be lazy. This will help them in so many ways throughout their life. Work isn’t really a four letter word!!! Money doesn’t grow on trees. Kids need to learn that it does have a limit, and when it’s gone, it’s gone. Delayed gratification: learn to save! Set age-appropriate goals, allow your child to work towards something. Imagine their sense of pride and accomplishment when they’ve EARNED something by working for it. Do you think it’s easier to give away money that’s not really yours anyway? Of course it is! Teaching your children that everything is really God’s money anyway will help foster a giving heart….now THAT will go far in their lives! When their old enough, teaching your child the importance and benefit of a budget is crucial. Starting the habit when their younger will make it second nature when they’re grown and have much more at stake. Help them tell their money where to go, not wonder where it went! Debt IS a four letter word! Just like in our situation where it’s taking EXTRA work, sacrifice and lot of years of our lives to get rid of, debt can truly ruin your child’s future. Raising them to avoid it altogether can do amazing things for them. This is one of the best things you can teach your child! Student loans: AVOID THEM! There’s so many other options, and even Hubby and I (thinking back) could have paid for our college a dozen better ways than the loans. We just didn’t realize, and didn’t care. If I gave ONE piece of advice to my sisters and children on finances….avoid student loans! 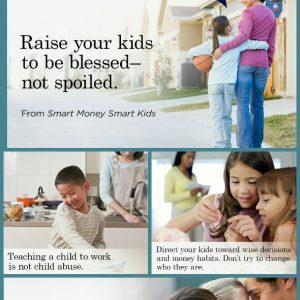 Really, there’s TONS in Smart Money Smart Kids that every parent should utilize with their children. Heck, they even cover the different types of family situations (divorced, step-families, special needs kids, etc.). Seriously, they cover EVERYTHING you need to set your kid up for success! Smart Money Smart Kids is available for pre-order NOW…and comes out April 22nd! So do your kids and all the future generations a favor and go pre-order it RIGHT NOW. It could be the best purchase you ever make for your child’s future.